A simple and facile hydrothermal methodology for preparation of carbon microspheres supported with silver or platinum is presented. Electrocatalytic properties of modified carbon microspheres are tested against the electrochemical reduction reaction of hydrogen peroxide. As revealed by transmission electron microscopy, silver and platinum are immobilized on the surface of carbon microspheres in a form of nanoparticles. In addition, scanning electron microscopy reveals coexistence of smooth surface spherical-shaped carbon microspheres together with clusters that resemble a bunch-of-grapes. 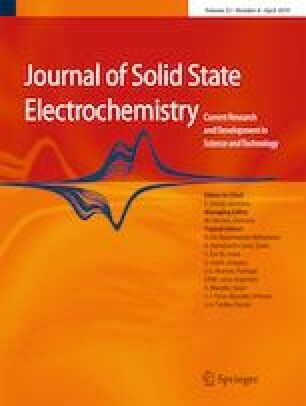 Carbon paste electrodes in combination with cyclic and square-wave voltammetry are used to study electrocatalytic properties of carbon microspheres. Voltammetric data are analyzed in light of the theory for simple irreversible electrode reaction. Correlation between experimental and theoretical data implies the highest electrocatalytic effect in the case of silver-modified carbon microspheres, though the electrode mechanism is more complex than theoretically predicted. This work was supported by the DAAD foundation through a multilateral project “International Masters and Postgraduate Programme in Materials Science and Catalysis” (MatCatNet) and the Serbian Ministry of Education, Science, and Technological Development through the framework of the projects TR 34008 and III 43009. VM acknowledges with gratitude the support through the NATO grant SPS G5550. Where ks is standard rate constant and α is electron transfer coefficient. φ = nF(E − E0’)/RT is dimensionless electrode potential measured versus the formal potential of the electrode reaction E0’; additionally, R is gas constant, T is thermodynamic temperature, and E is electrode potential. Where, Ψ = I(nFAc*)−1(Df)-1/2 is the dimensionless current under conditions of SWV, Sm = m1/2 − (m − 1)1/2 is the numerical integration parameter, and m is the serial number of time increments, κ = ks(Df)-1/2 is the dimensionless kinetic parameter, and f is the frequency of the potential modulation. The time increment is defined as Δt = tp /25, i.e., each potential pulse is divided into 25 time increments. All simulations have been performed by the commercial package MATHCAD 14.